Yadier Molina and Colby Rasmus supplied six of the St. Louis Cardinals' eight hits Wednesday night, helping edge the Detriot Tigers 4-3. The three-game home stand -- and series -- with the Tigers is already won for the Cards, now 2-0, and who hope to sweep Thursday night at Busch Stadium. The run production was just enough to help starter Todd Wellemeyer even his record at 6-6. Wellemeyer still did not look comfortable on the hill, but show signs of progress. He seems frustrated that cannot seem to maintain some level of effectiveness. Most noticeable was how well he pitched when following through, something he hasn't always accomplished, short-arming to some degree at times. Too much mechanics on the brain may be the dilemma, and that happens to just about every pitcher at some time or other, and especially when struggling. Manager Tony La Russa pulled Wellemeyer in the sixth inning, not even to 100 pitches (91), having gotten in enough work and able to depart with a lead. Wellemeyer looked capable of going much further, but the skipper picked his spot, and things worked out for the squad in the end. Molina cranked a solo home run to left-center, about three rows up in the bleachers. He had been hitting many line drives, and normally waits out a pitch long enough to lace it into right field. A by-product of this productive style of hitting, however, is that once a hitter is in tune, he often times really "sees" the ball well, and without the self-induced pressure of trying to hit a long ball, hits one anyhow. In this case, a well-time stroke by Molina that pulled the ball about as far to the left side as you will see the Cards' catcher pull. 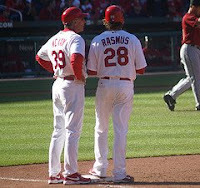 Rasmus continued to lash out at opponent's pitching, doing well at choosing fast balls and with a healthy dose of bat speed, able to pull pitches to right field and even smooth them out into center at times. Wednesday night, he cranked a ball high off the right field wall, inches from a round-tripper. Once the bat is out of the rookie's hands, however, the baseball IQ seems to drop rapidly. The walled hit turned out to be Rasmus's first big league triple, but he may have created an opportunity for an inside-the-parker if he had run hard out of the box. Instead, he ran just off a full speed pace to first base, then turning on the speed once he saw the ball was indeed, not going over the wall. Rasmus would end up getting tagged out at home plate not long after, on a ground ball in which he glided toward home, once more turning on the speed too late, his slide creating a close play at the dish, but one which would go against him and the Cards. The center field defense of Rasmus certainly looks like a rookie, which is understandable, but the way in which he moves -- or doesn't -- indicates an indecisiveness which can appear as if he is lazy, but which suggests he simply doesn't possess the instinctual baseball knowledge that makes a player react and "go for it." For an example of a player having a clue, or think he does, review many plays by Joe Thurston. Does he make mistakes. Yes, and enough to get a coach cringing, but Thurston's mistakes are often the right kind, meaning he had an idea of what to do in given baseball situation, and did it, full speed. The end result -- good or bad -- has taught Thurston a lot about that particular situation. Conversely, a Rasmus play of indecisiveness teaches him nothing. Brendan Ryan is another great example of "learn while you burn." When you view a Brendan Ryan play, at least, after it's over with, you can say, "By golly, he gave it a 100%, even if it was the wrong play." But Ryan would then know the difference, well, maybe after a couple of the same mistake, but still. So Rasmus, to pick on the rookie, would probably do himself a big favor and make everyone else feel much better about this execution of baseball plays if he let go of what appears to be fear of mistakes, or worry over choices, and simply went all out on his best instinct, even if that was way off the mark. The bat is keeping Rasmus in the bigs; his other baseball skills ... maybe not so much. But another part of Rasmus that can make things so tough for him is that he does appear to have a lot of big league potential, and he has proven quite a bit of that potential as well. So the "pick-apart his every fart" attitude being put forth here is probably due to just how good a player Rasmus could develop into, for if he had not shown the potential, there wouldn't much of discussion going on here.